By now, you likely know that Pantone’s color of the year for 2017 is Greenery. Here is my completed quilt top “Greenery in Bloom”. It finishes at 60″ square. I finished this top today as the sun was out and it finally started to warm up and feel like spring. 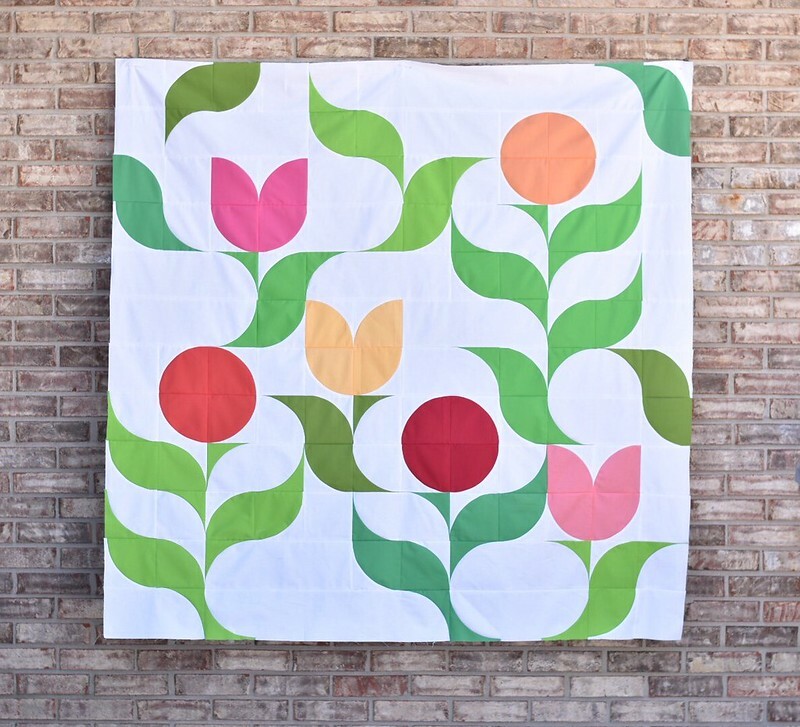 Perfect timing if you ask me because this quilt practically screams SPRING! 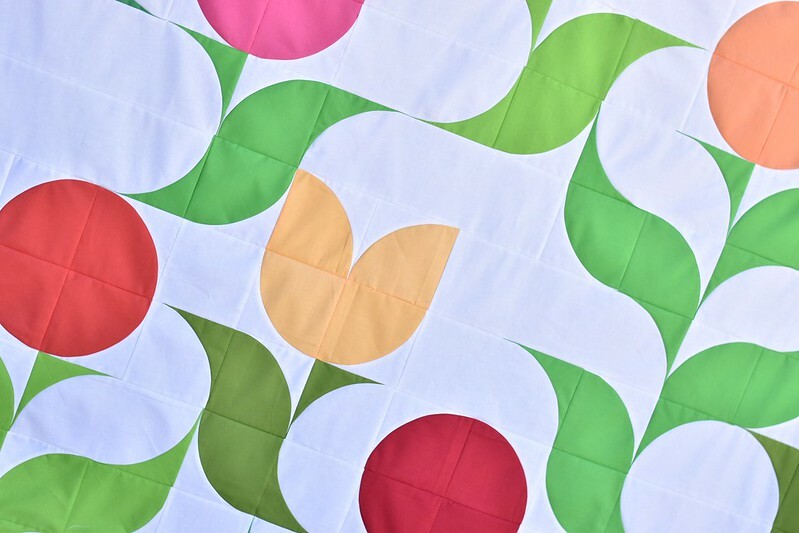 I think my favorite part of this quilt are the circles…as close to perfect as I could get! Now, how should I quilt it? Are you participating in the Pantone quilt challenge? If you haven’t started yet, there is still time…and some pretty great prizes up for grabs!! Girl! It’s beautiful. It looks JUST LIKE THE SKETCH!!!! love love love. It is indeed SPRING! I love it. I will be honest here, but I am not normally fond of the modern quilts, BUT, I REALLY LOVE your quilt. In fact, I like it so much, I heard my husband get up from the couch in the other room as I was looking at it and called him in to check it out too. Even he likes it. GOOD JOB! Are you planning to write this up as a pattern or tutorial? I would be interested in attempting this one myself. What a picturesque way for drunkards path! It is beautiful! I don’t think I have ever before seen a quilt based on Drunkards Path that I liked. You have made me change my mind about the block. It is beautiful and celebrating spring could not be done in a better way. Can’t wait to see how you decide to quilt it. 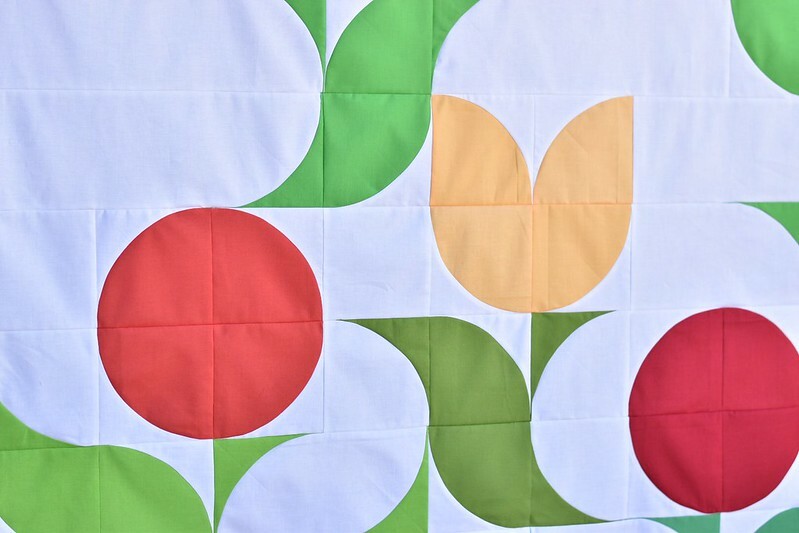 love this quilt – looks like something that can be worked up using the mini curves ruler. Absolutely beautiful!!!!! I love it!!! Really like this a lot! Love the use of the greens too. gives it a dappled sunlight or shimmer to it! WOW! I love your modern use of the Drunkard’s Path block! 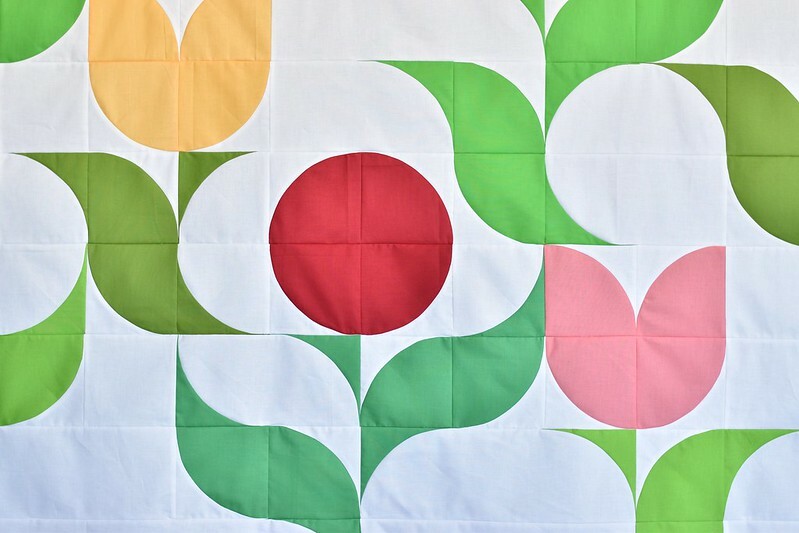 Like VickiT, I’m not usually a fan of modern quilts, but yours is just absolutely beautiful! Soooo creative! Did you hand-piece or machine-piece the curves? Also, photographing it on the brown/tan brick wall really makes the quilt top jump out at you. Good eye!